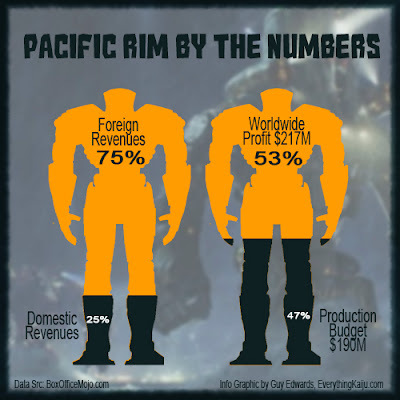 Pacific Rim underlined an important message for Hollywood: The American market is an afterthought. The movie grossed $407 million worldwide, and only a quarter of that came from the United States. It's no great mystery why. It was the first big-budget spectacle to depict on film the battle between kaiju and mecha so common in Japanese manga and anime, and it was the vision of a Mexican director, with Black, Japanese, Russian, Chinese, Australian, Spanish and American actors. You know, what people in the world actually look like. It might have been the first blockbuster blatantly titled after its target demographic. As a Kaiju enthusiasts, it's obviously great to hear how a favorite movie can also change an industry. This also bodes well for the possibility of a sequel. At ComicBook.Com, Scott Johnson writes about a similar sentiment. So, financially there seems to be a good argument for Pacific Rim too. Del Toro has announced that a script for Pacific Rim 2 is in the works. You can watch Guillermo del Toro talk about Pacific Rim 2 in our earlier post.